Above: Raw cocao beans on the right, roasted and de-husked beans on the left. When I first decided that researching early use of chocolate in Britain would be interesting, little did I realize how difficult it was going to be. In the great part this was because I had very little knowledge on the subject. I knew that the Spanish had brought chocolate back from Mexico and that it had been consumed in Western Europe more or less continuously, but that is all I knew. What I didn't realize was for all of the millions of chocolate bars, kisses, truffles and bunnies eaten now, these items actually has very little to do with how people have historically viewed chocolate or the form that they consumed it in. So now a little potted history of chocolate***. The cocao tree is a modest looking understory plant of the forests of South and Central America, however, cocao has be cultivated for so long in this region that it is unclear if truly wild populations exist. All exsting "wild"populations could actually be feral, such is it's close association with humanity. Linguists now believe that this plant became a named item by approximately 1000 BC, from this point it seems to have been used as a luxury item by successive waves of Central American civilizations until finally Europeans first came into contact with it during the Spanish invasions of what is now Mexico in the 16th century. The first contact by Europeans with chocolate seems to be when Columbus on his fourth and final voyage captured a Mayan trading canoe and its cargo of cocao beans off the Yucatan coast. 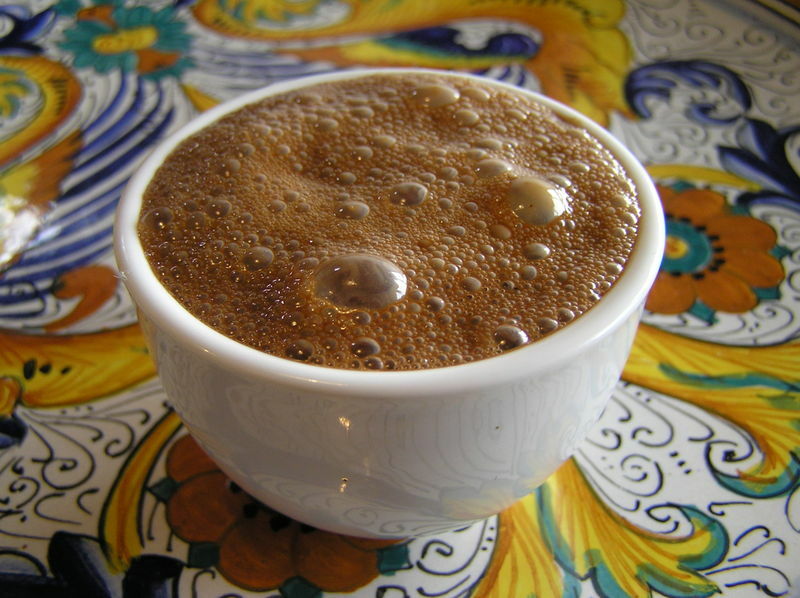 Further and more sustained contact was made by the Spanish during their invasion of Mexico, where they encountered the cocao beans being used to produce a foamy drink for the Aztec elite. While at first the Spanish didn't particularly like this drink, by the end of the 16th century cocoa beans were exported back to the Old World and was being used to produce foamy cups of chocolate. The major difference between the Aztec and the Spanish mode of drinking the dish was in the addition of sugar by the latter. Throughout the 17th century "chocolate" gradually became known in Western Europe, although it essentially remained the same beverage drink as consumed in Mexico. Consumption of chocolate in the solid form was not unknown, but it was extremely rare. Given that the vast majority of chocolate is now consumed in the solid form now, why wasn't this the case historically in Europe? While it is possible to derive some sense of why people didn't consume chocolate in the solid form by reading contemporary texts, another angle is to actually just eat some 17th century chocolate! This is possible as numerous historical texts give recipes for producing chocolate and one English text (Henry Stubbe's "The Indian Nectar or a Discourse concerning Chocolata" 1662) gives very detailed instructions. In general these historical recipes were identical in all important respects, using the Mexican metate to grind the roasted beans and then moulding the chocolate paste until it set. Major differences occured only in the amount of sugar used and the type of additional flavours added. 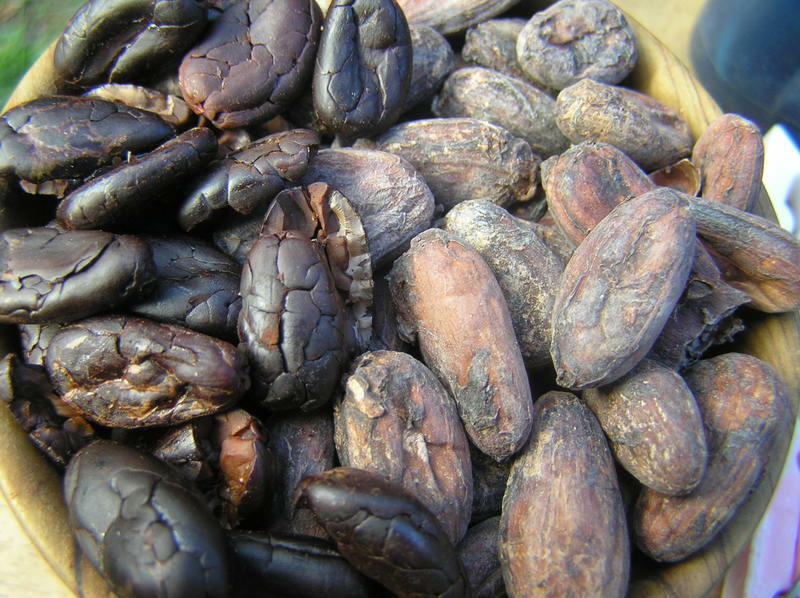 By obtaining some raw cacoa beans I was able to produce something that should pass as 17th century chocolate. First I roasted the cacoa beans in a hot oven, as soon as they husk loosened from the kernel I removed the beans, cooled them and removed the husks completely (very time consuming). Lacking a metate I ground the kernels finely in a food processor, then placed the grindings into a heated motar where I processed them to a finer, sticky paste. At this point I added sugar and flavourings and placed the mixture into a mould to set. Although many different flavourings and levels of sugar was used historically, I decided to only use vanilla and 1/3 weight sugar to gain as "pure" an impression of the flavour of chocolate itself. Below is shown the fruits of approximately three hours of labour. Above: 17th century chocolate. Actually, this is pretty much any chocolate from pre-history to the early 19th century. So what did it taste like? Well actually it tasted like chocolate, some fruity plum and raspberry flavours, but essentially anybody would recognise it as "dark chocolate" by flavour. No real surprise there then. What did differ a great deal was the texture. Now I'm sure that 17th century professional grinders of chocolate produced a finer texture, however I am going to assume that my journeyman effort would past muster.... Overall my impression was that it was dry and crumbly, more like shortbread then modern chocolate texture. What was a big surprise was that to a modern palate like mine it was actually quite pleasant. I had assumed that it would be bloody awful and that this explained why people didn't eat chocolate in the solid form historically. This doesn't seem to be the case and when you think about it, it isn't relevant anyway as you can produce chocolate as a flavouring for other solid dishes (think chocolate cake) where texture of the chocolate isn't an issue. 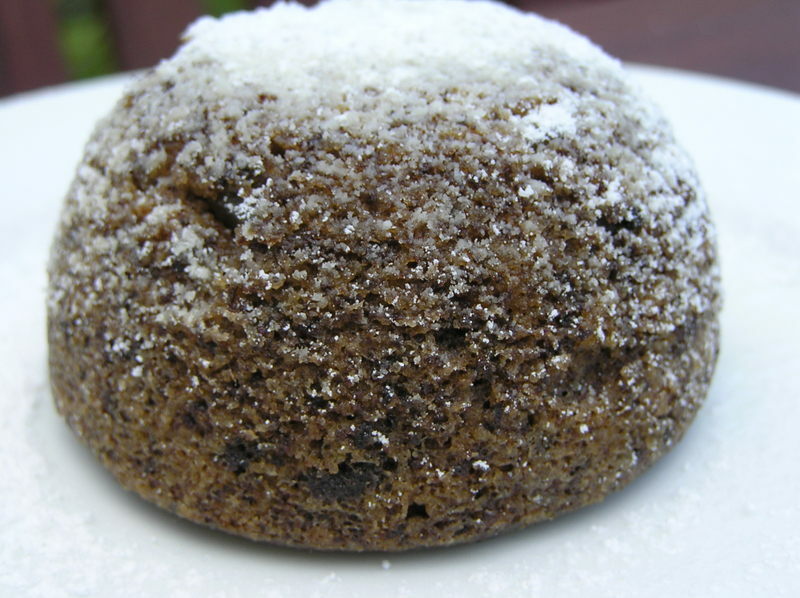 So why isn't there any 17th century chocolate cake recipes? "...It is true, Hippocrates saith, It is easier to be nourished with Drinks, solid meat; and that They, who have need to be quickly refreshed, must be dieted with Drinks, or potable liquors: but these two sayings make not for the giving of Chocolata in Paste, or Confects, no more then his recommending in sundry cakes........."
So in otherwords drinking chocolate was very healthy, but solid chocolate in 17th century England was considered in the main to be not especially good for your health. Surprisingly, while it is known that chocolate was being consumed as a 'healthy' beverage in by the end of the 17th century in England, the are still very few recipes for chocolate in any form in the many cookbooks published during this period. In fact almost none. After reading many texts the only recipes I can find that give an idea of what early English chocolate are like, are from the texts produced by England's first established female cookbook author Hannah Woolley. "A Queen like Closet", 1670. Take half a Pint of Claret Wine, boil it a little, then scrape some Chaculato very fine and put into it, and the Yolks of two eggs, stir them until well together, and sweeten it with sugar according to your taste. Boile some water in an earthenware Pipkin a quater of an hour; then sweeten it with sugar, then scrape your Chaculate very fine, and put it in, boil it half and hour; then put in the Yolks of Eggs well beaten, and stir it over a slow fire till it be thick. 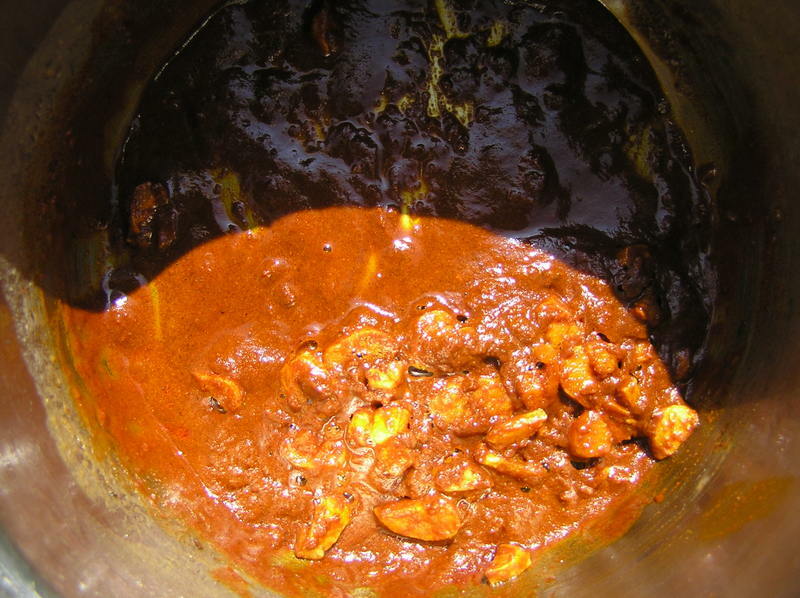 Above: Woolley's "Chaculato", made following the recipe above. As "Claret" of the time was rather different to the Bordeaux reds of today, I used a blend of Cabernet Rose and Muscat wines (as this is what I had in the house). It tastes like the most chocolately and boozey hot-chocolate that you can imagine. One tiny cup was enough for me. Another reason why recipes for chocolate where not common in 17th century English texts may be because of the issue of politics. By and large chocolate was consumed in coffee houses and these had the reputation of being anti-establishment. So much so that several unsuccessful attempts where made by the Stuart monarchy to ban public houses serving "Coffee, Chocolate, Sherbet, or Tea". Most mainstream cookbook authors and especially pro-Stuart authors like Robert May were simply not going to include recipes for chocolate as it was perceived as being a beverage for the wrong sort of people. Nevertheless as chocolate was consumed and eventually lost it's rebel image and the use of chocolate as a healthy beverage stumbled on throughout the 17th and 18th century in England. It is clear from reading some texts that while most people in England where aware of the existance of chocolate, it's use still was far from general. In fact in one case an instruction for creams of "tea, coffee, chocolate &c" is given as a footnote to a recipe for "Cream made with Gizzards" - simply replace the gizzards with Chocolate! This isn't to say that chocolate wasn't popular in England and some use for chocolate as a flavouring for solid or near solid dishes are given. Charles Carter in 1730 gives several recipes using chocolate, Chocolate pudding (see recipe below), tart and cream and in the middle of the same century Hannah Glasse gives a recipe for a chocolate cream (today it would be called a chocolate "mousse"), later at the end of this century John Farley gives instructions for making chocolate flavoured cream and a sort of chocolate meringue pie. But by and large in the 18th century chocolate still remained a "healthy beverage" and so it remained into the begining of the 19th century. In fact, at the begining of the 19th century most recipes for chocolate or cocao/cocoa were in the "invalid cooking" section of cookbooks. The industrial revolution had changed the way that chocolate/cocoa powder was made, but essentially while steam was being used to produce a finer, more consistent grade of product, it didn't differ hugely from the product being made in pre-conquest meso-america. The great leap forward in chocolate processing technology occured in 1828 the Dutch chocolate maker Van Houten developed a relatively inexpensive way of pressing cocoa beans in such a manner that the majoritory of the cocao fat or "butter" was squeezed out. Cocao beans are approximately 50% fat by weight, before Van Houten's development this ment that cocao beverages contained a great deal of fat also. 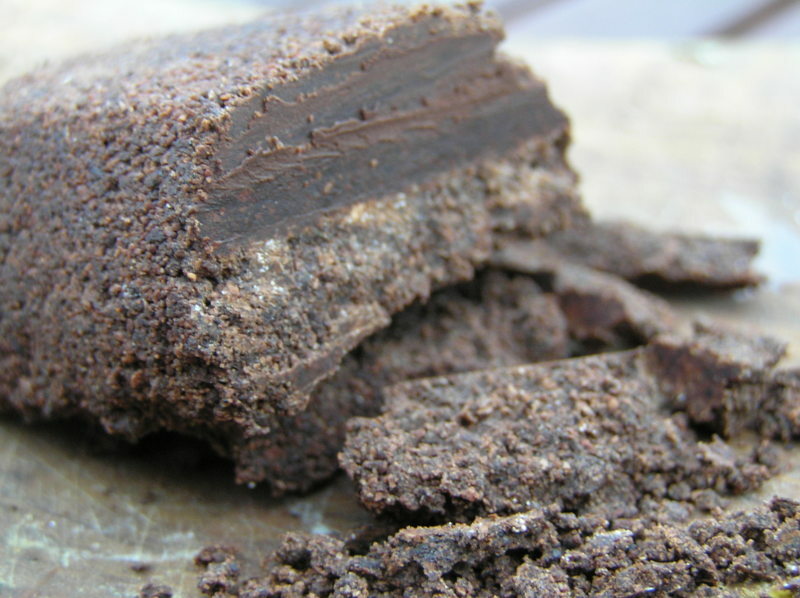 In practical terms this made the cocao solids hard to disolve and the fat either had to be removed or dispersed thoughout the solution. This is the reason many earlier recipes for chocolate drinks are boiled for such a long period, are whipped to a frenzy or are mixed with egg yolks and/or cream - all a ways of dealing with the fat issue. Van Houten's breakthough lead to two great developments - modern de-fatten drinking cocao and if sugar and extra cocao butter are added back to the finely ground cocoa solids you can produce a solid, melting, modern-type chocolate bar. By the middle of the 19th century this modern type of chocolate bar was produced by Fry's in England. By the end of the century, more technological improvements and innovations had put the solid form of eating chocolate firmly on the track to becoming the most popular confection of the 20th century. Chocolate is now so popular that most people don't realise that for that most of it's history chocolate was actually a drink and in bar form it is so iconic now that commercial "chocolate" can be produced that contains little or no cocao butter and can contain as little as 15% cocao solids. So five hundred years of after the introduction of chocolate to Europe, people will drink a hot cup of cocoa or chocolate before bed or when ill, with out realising they are part of grand tradition of drinking chocolate for reasons of health and the reality is that most chocolate that is consumed is actuallly in the form of "not-actually-chocolate" bars. Charles Carter's "Chocolate Pudding" from "The Complete Practical Cook", 1730, as adapted by me and rather delicious. The original recipe suggest that the pudding mixture is either baked in pastry shell as a tart or boiled (in a pudding cloth). 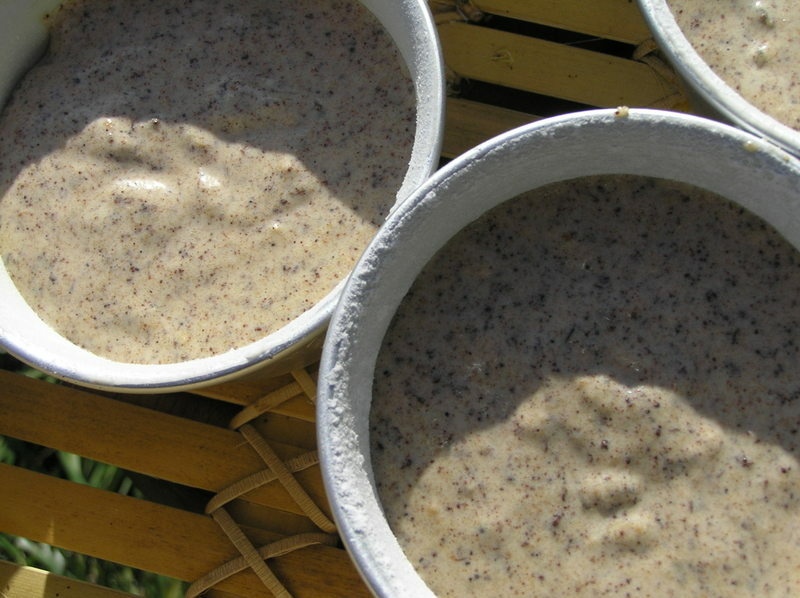 I like making puddings in a cloth, but in this case I decided to make individually moulded puddings, as they are more practical and are likely to be of more use to interested cooks. The main ingredients. 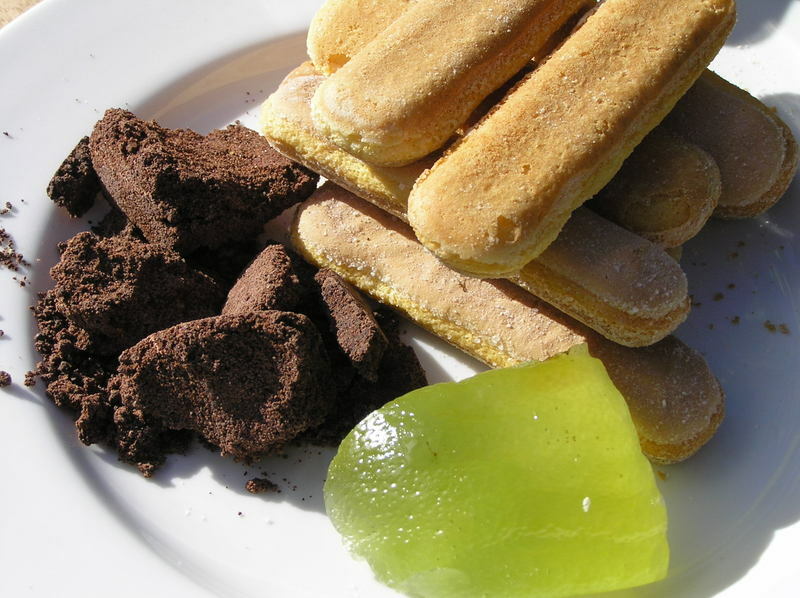 80gm sponge fingers, 80 gm chocolate*, 50 gm candied citron peel. Finely grind the sponge fingers and chocolate, add the finely diced citron peel** , 1/4 teaspoon of cinnamon and 1/4 teaspoon of mace. Blend together 2 whole eggs and 2 egg yolks with 250 ml of cream and 1 teaspoon of orange flower water, very well, until foamy. Fold this into the dry ingredients and fill, buttered and icing sugar dusted pudding moulds or tea-cups. Steam for 40 minutes, take off the heat and carefully turn out. Pudding made in a teacup and turned out. 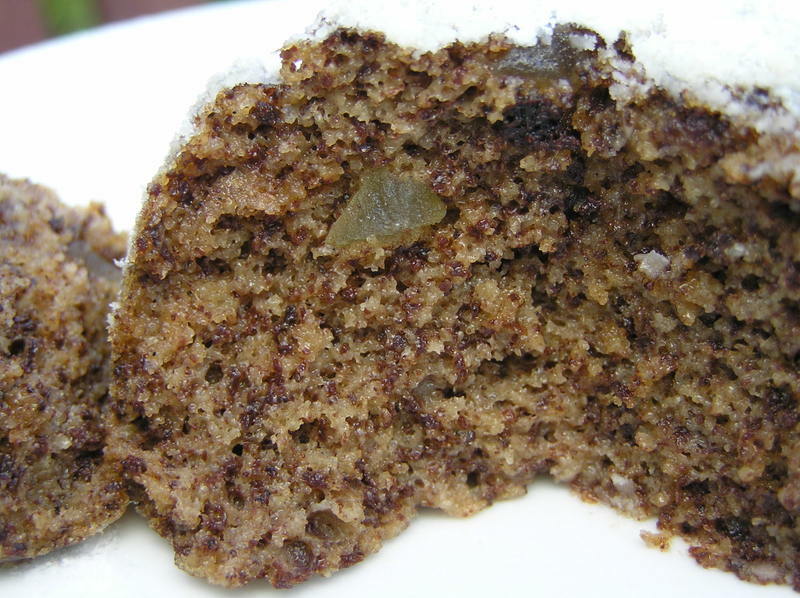 Interior of the pudding, which is light and moist, a cross between a light cake and a custard. Not overly sweet either. * Assuming that you will not have 17th century chocolate in you pantry, substitute Mexican chocolate or good quality dark chocolate. ** Citron peel can be replaced by candied ginger. Not in original recipe. ***The history of the cocao tree (Theobroma cacao) and chocolate is as complicated as it is interesting, for more details I suggest reading the truly excellent "The True History of Chocolate" by the anthropologists Sophie and Michael Coe). The term "Peasant food" or variations like "cucina povera" seems to be a favoured devise for conveying the sense of the simple rustic existence. Lovely. Unfortunately, along with a simple rustic existence most peasants have back-breaking labour, lack of control of their life direction, malnutrition and disease to contend with. If you had the misfortune to be born female then life could be even worse, if you didn't die during giving birth or shortly after, then there was always the possibility of a life of domestic slavery. Basically, the peasants lot in life is a bit rubbish. However, the fact remains that for modern urbanised populations, it is almost impossible not to idealise this "simple rural existance", in fact I find the idea of a small parcel of land with vines, vegetable plot, pig-stye and a few goats impossibly attactive and I am only a generation or so from the basic reality of the situation. Part of the reason for this is that in English we have a term "peasant", but nothing really concrete to attact it to, other then a vague ideal of idealised rural poverty in Europe or historic poor in the UK. Most people seem to be unaware that the Italian "paesani" refers villagers, not to people working on the land. "Contadini" were the people renting small parcels of land and living in impoverished self-sufficiency. An Italian paeasani would have considered themselves well off in comparison to a contadini, however this type of social nuance is lost on most English speakers. The exact nature of the rural poor lot in life varied hugely both with region and time period, but the basic premise is that a land-owner would rent out a parcel of land to an individual, and this involved mutual obligations by both parties. Unfortunately, this arrangement could be so heavily weighted in favour of the land-owner, that the tenants were virtually selfs, with no ability to improve their living conditions or even leave the property if they felt like it. The inability to move locations if you desired to was in part due to the contractual obligations (in some case you or you children were not allowed to leave a certain defined area), but often simply due to lack of money, finacial obligations mostly being fulfilled through barter or exchange in kind. One such arrangement might be that you gave 50% of all produce to the owner, this includes grain, oil, beans or any other crop. Obviously this allows much room for the tenant to cheat the owner, so in many cases you might be asked to provide a certain amount to labour on the owners lands or have to provide a certain volume of produce. In good years on good land with a sensative land owner this may not have been a problem, but in poor land in a bad year with a grasping owner it could mean death for you and you family. Most people lived somewhere in between these less then idea states. 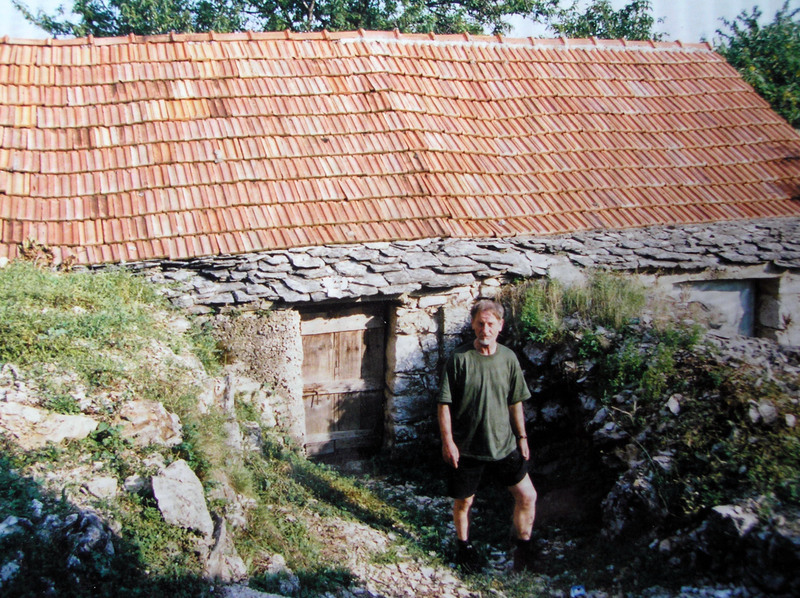 Above: My father standing in front of the single room cottage where his mother was born. The slate roof has been partially replaced with modern tiles sometime in the last twenty years. As you can see the cottage is partially subterranean and very small for a large family. The simple life in Tuscany it's not. Above: Another view of the cottage (note the taller stucture is a modern addition). As you can see the roof is at the same level as road. During winter snow would easily reach the roof. Above: The small plot of land at near the cottage. 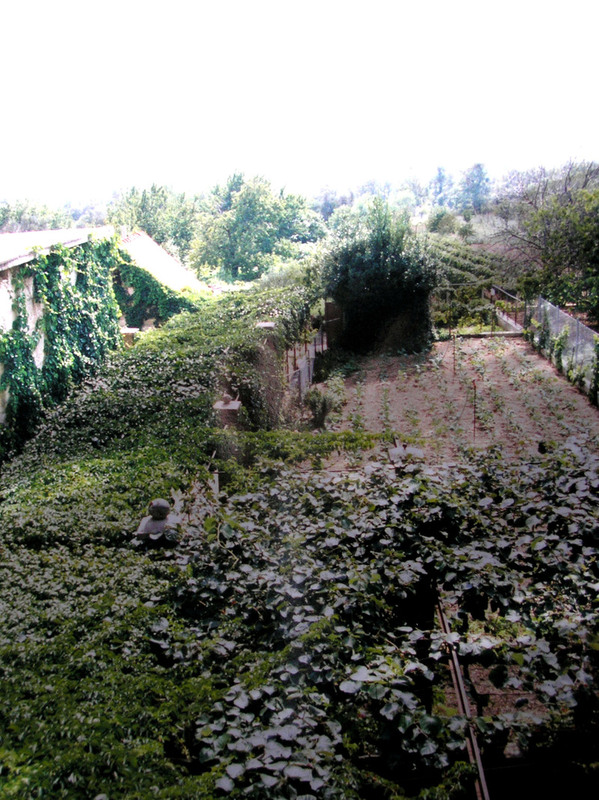 Fruit trees, vines and vegetables, but hardly enough to support a family on. Above: Interior of the cottage (click to enlarge image). Here you can see the hearth in use.Some escapes through gaps in the roof tiles. Fuel was very valuble, so cooking technology reflects the limitations of the fuel availability. 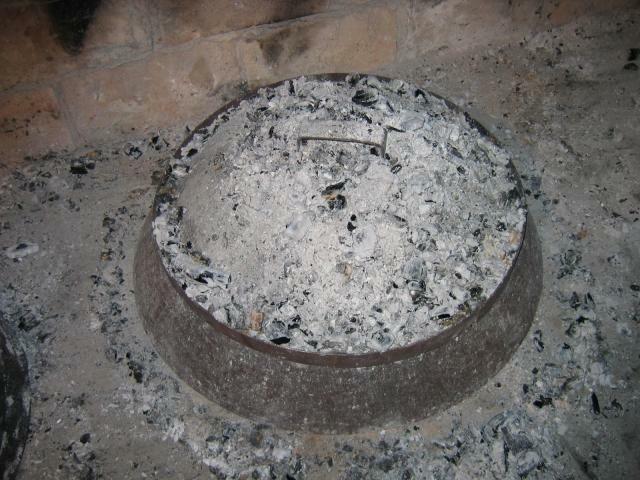 Small sticks are burnt at the back of the hearth, the coals being racked forward to be used under a gridiron ("gradele") in this case, but above the fire can be seen a chain for suspending pots of various sizes and to the right of my cousin can be seen a large baking iron. Large pots/cauldrons could be inverted and used as ovens to bake bread. Not should here is a "Peka" (Bell). This is a metal cover that fits tightly over an inner metal sleeve, ash and charcoal can be piled on and around this vessel to cook the ingredients very efficiently, either in a small amount of liquid or as a braise (in fact the French term is derived from braise "live coals", reflecting the use of similar cooking vessels in France). Food cooked in this way is said to be "cooked under the bell". 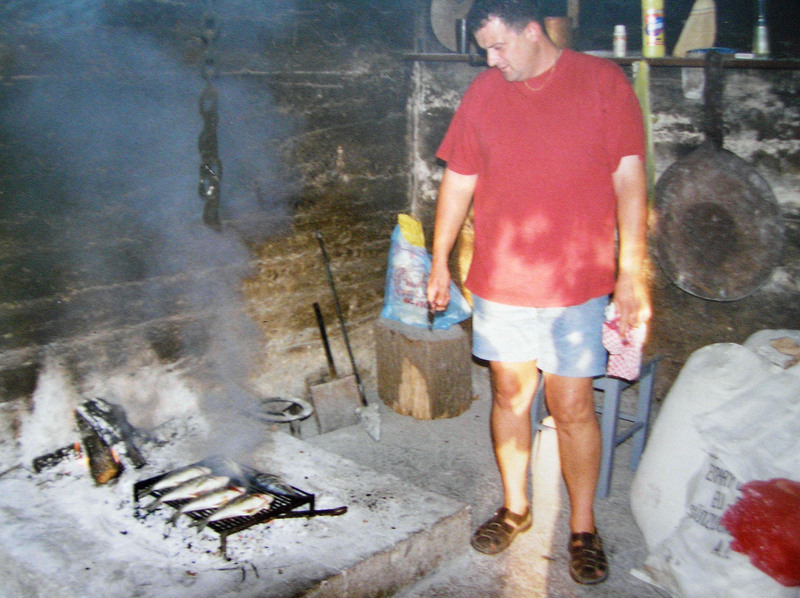 An example of a Peka in action can be seen here, the image is taken from the excellent Croatian travelog by egullet member Poots. Typical dishes cooked under the bell are octopus, lamb, calamari stuffed with rice and fish stews, obviously not everyday dishes. 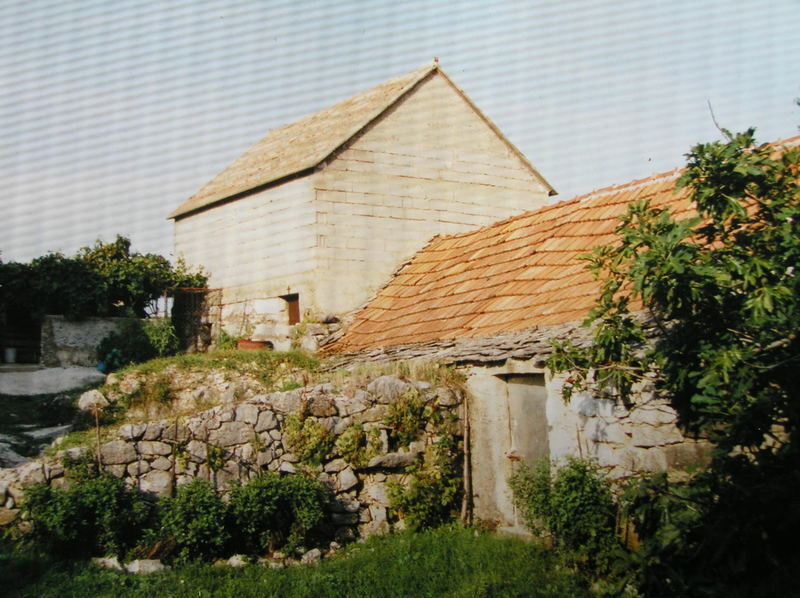 One English traveler in the region during the early 19th century made the following observations about these rural Croatian cottages, obviously there was not much change in the lifestyle of the rural poor until very recently in Croatia. "In the middle, or at one corner, of the room, is a raised hearth, on which a wood fire burns beneath an iron pot, suspended by a chain from the beam above…the room, too, had no chimney; and the smoke, leaving no crevice untried, invaded every nose and eye it could find, so that, despite the cold, I was obliged, every now and then, to fly to the door, and gasp for breath." While there is a great deal of sentimentalisation of lives of the rural poor, there is a big difference between this idealising the past and being interested in the past. I think that as people that are interested in regional food cultures we are very lucky as we have the luxury of looking at the cuisines of societies that are either undergoing social changes that are acceptable to us, or cusines of cultures that have undergone this change in the near past. The oppertunity to examin these types of cuisines in flux is not something that lasts forever, so I feel pretty privileged to be able to do so. These types of social transitions often occur before anybody bothers to record any information about these people. Sometimes in reading historic documents will come across a paragraph or a line that brings these ghosts into the light, but for the most part every moment of the dasy of the rural poor is lost. I think that this is one of the greatest of human tragedies. So while there is a lot of un-thinking middle-class sentimentalising of many poverty culture cuisines, it is worth considering that exactly these same cuisines and cultures are deserving of being recognised, rather then loosing them forever. In terms of my families recent rural poverty and for families like them, the oppertunity to move to New Lands and re-invent their lives has always been and continues to be a very attractive proposition. My father's family were part of the massive wave of immigration to Australia from Southern and Eastern Europe during the early 1950's. Like many New Australians, this meant massive family stress and upheaval, both good and bad, but for 2nd generation decendents like me it means the oppertunity to make whatever I wish of my life, not something that my ancestors with their simple rustic peasant cusines ever had access to. 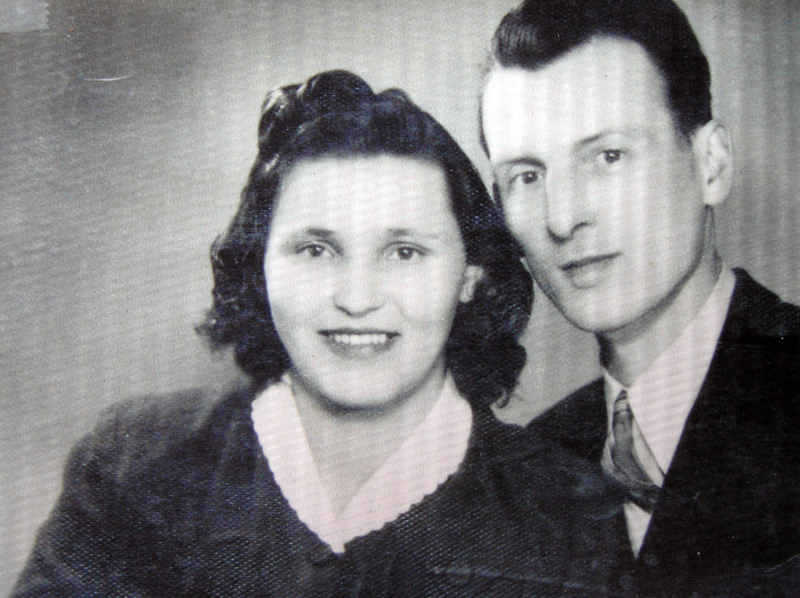 Above: A photograph of my grandparents taken in the 1950's. New lands and new oppertunities obviously impact on cuisines. Ingredients differ, recipes are lost, new influences creep in, family structures differ and economic costs make a difference. In Australia possibly the greatest difference of all for my family was the availability of cheap, year round meat and fuel. Dishes that were once made for special occasions and festivals, become part of the normal weekly rotation of meals. The New Land becomes a magical place where the special dishes of Christmas and Easter are eaten all the time. In effect Australia had become Boccaccio's peasant's dream country of Bengodi where vines are bound with sausages, rivers run with wine and ravioli tumble down mountains of grated cheese - a peasant's paradise indeed. Does it matter then if the sausages are not quite as savoury as the ones back home, the types of vegetables and fruit are not the same and that while there is a lake of Shiraz and Cabernet, nobody has heard of Plavac mali? 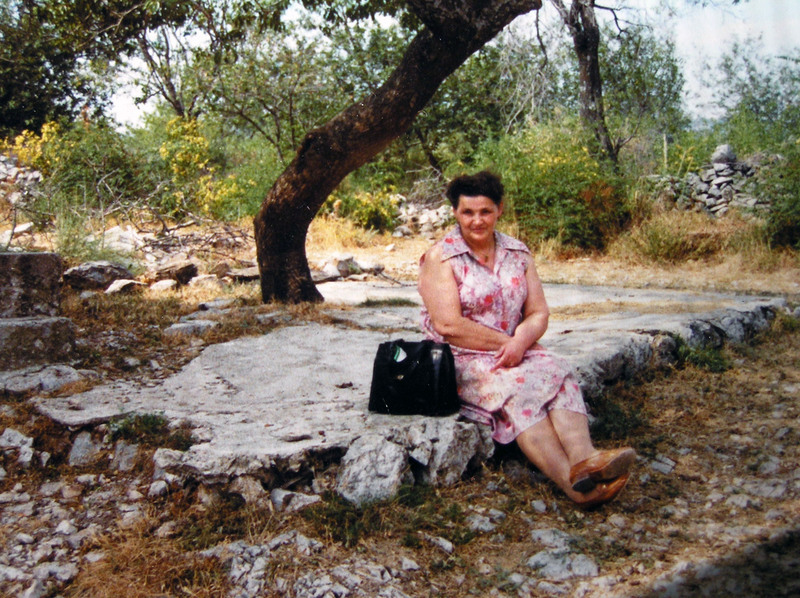 Above: A photograph of my grandmother under her family olive tree in Croatia taken in the 1980's. Oddly enough these things do matter, even to ex-peasants and their children. My Baka (grandmother) is a stellar cook - as all grandmothers are. I rememer sweet bread stuffed with poppy seeds, cakes oozing with nuts, spice and sweet honey, chicken soup before every meal, fresh bread made daily, roast pork which is still my bench mark, and delicate shortbread biscuits. 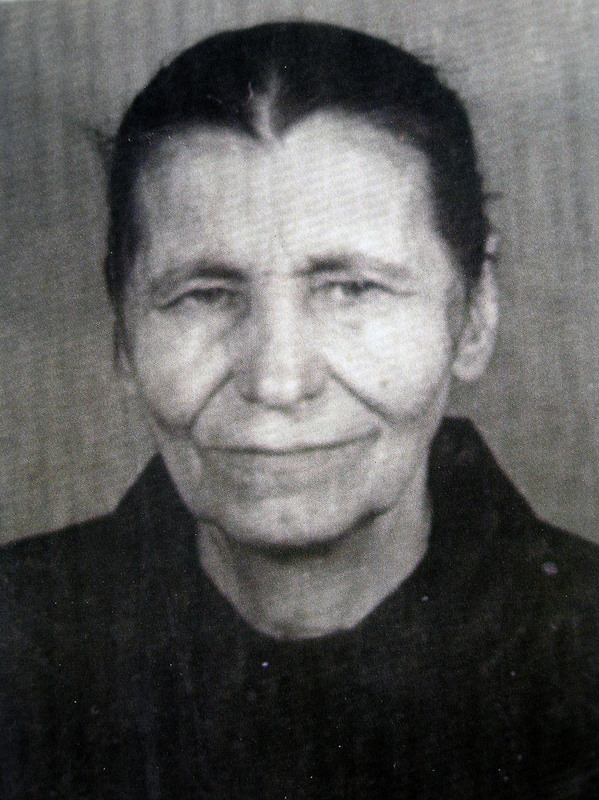 But for all the pasta, polenta, fresh bread, cakes, pastries, meats and fish dishes, I think that my family would agree that the one dish made by my grandmother that they think of most of all as "her's" is simply bean soup. 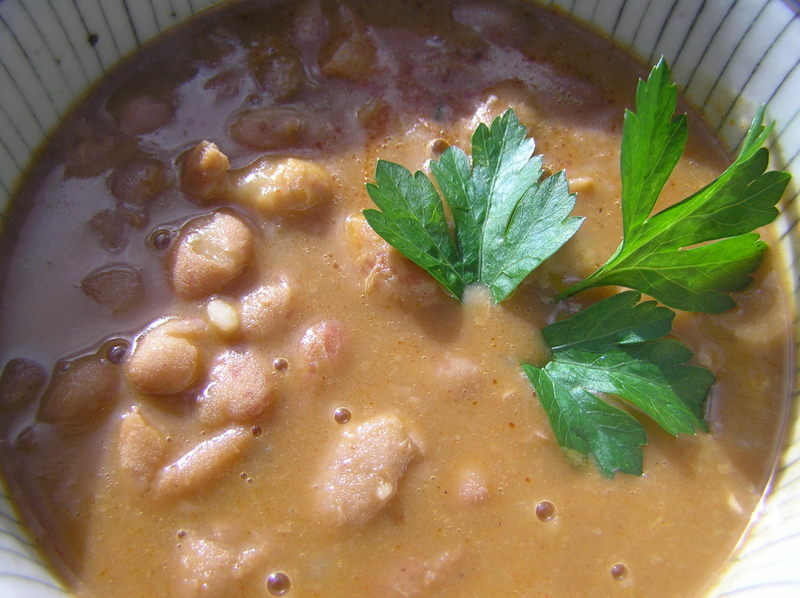 Plain, ugly brown, savoury, delicious, perfect, peasant bean soup. 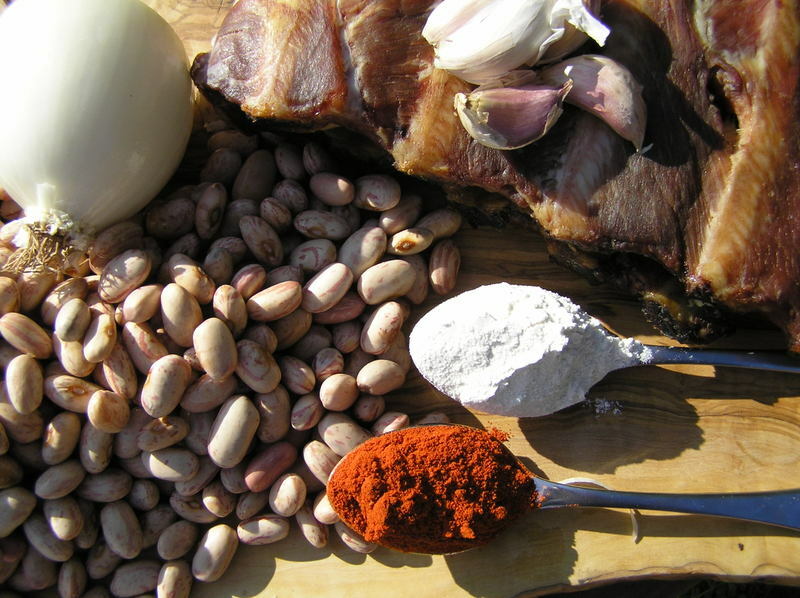 Bean soup: Simple to make, but is shows several techniques for extracting maximum flavour from limited ingredients. For example the flour is browned and added not so much as a thickening agent, but to add another layer of depth to the flavour of the soup. 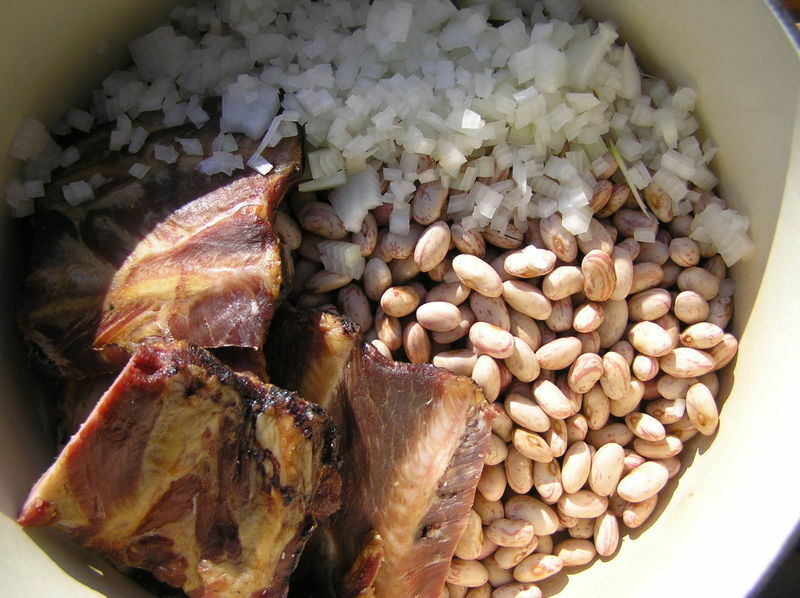 The raw ingredients: 500 gm beans (borlotti or red kidney) soaked over night, one sheet smoke pork ribs, one medium white onion, six cloves of garlic, one Tablespoon of paprika and plain flour each. A smoked ham hock can be used if you are feeling wealthy. Raw onion is chopped and added to the ribs and beans. This is covered with water and brought to boil. At this point the liquid is drained of and discarded. New water is added and the soup brought to a gentle simmer. The garlic is gentle fried until golden (not brown as they will make the soup bitter) in either fresh lard or olive oil. Garlic is then removed and the flour is added to the hot fat. This is carefully stirred until a red-brown roux is created. Off the heat both the garlic and paprika are added. This takes out the raw flavour of the paprika (something that no amount of boiling will do). 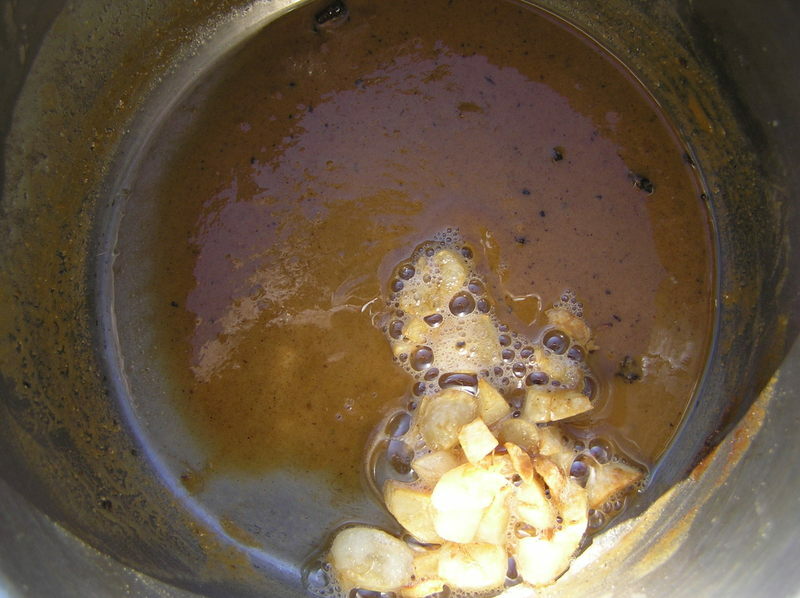 This roux mixture is added to the beans which are cooked until the beans are soft, but not falling apart. The ribs are removed and discarded, their job is done (if I was a true peasant I would obviously eat them). Either pasta or cubes of potato are added in the last 15 minutes of cooking normally. Soup is seasoned with pepper and salt. Yes, it is brown and ugly, but sometimes brown and ugly can be wonderful.